The Foundation for WAPS Announces its 2018 Dare to Dream Winner! Jen’s dream is to incorporate virtual and augmented reality into education and training in the classroom to achieve this goal. Jen proposed using the ground-breaking technology of Class VR that immerses students into content in a way that cannot be accomplished in two-dimensional space of paper or a computer screen. The library includes over 700 curriculum-aligned resources which provides content on topics, such as, historical times, habitats and nature, cities and structures, conflicts and disasters, physical features, science and technology, and arts and culture. Beyond the resources included in the set, teachers can create their own virtual reality experiences using 360 degree photos and videos. In addition to the physical components of the set, ClassVR includes online help and on-site technical support. Virtual reality and augmented reality build on current effective practices of immersing students in cultural, scientific, artistic, and mathematical thinking, in order to experience that content from within and to help understand it to a deeper degree. As an example, through the use of virtual reality, students can “walk-around” inside an animal cell and look around to identify parts of the cell and witness processes up close. They can also “walk along” the Great Wall of China and view the landscape from atop the structure. With augmented reality, students might rotate a 3-dimensional human heart in their personal space as if they have access to the actual object. Congratulations Jen Snook for Daring to Dream! Every dollar donated to the Foundation for Winona Area Public Schools will go towards grants and programs that will enrich the lives of students across the city. The Foundation Proudly Presents the 2019 Legacy Award to Mary Bergin! 2017 Payroll Deduction Grant Winners! The Foundation for Winona Area Public Schools Raises over $49,000 for the schools! 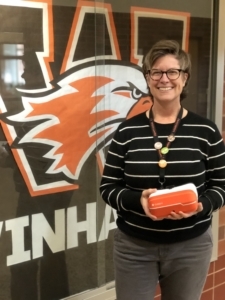 The Foundation for Winona Area Public Schools is an independent, non-profit, 501(c) 3 organization established in 1991 and funded entirely by community and business supporters of education in Winona. © 2019 Foundation for Winona Area Public School.